Great good news for Nike+ runners. Nike+ Run Club for iPhone and Apple Watch has a notable update out today just one day before the Apple Watch Nike+ starts hits stores. Version 5.1 includes a ton of improvements and fixes plus some new features like Apple Music integration and GPS support on the Apple Watch Series 2. The Nike+ Run Club app has received a big update that brings new features for watchOS 3, support for Apple Music, a new run summary screen, and much more. Nike+ Run Club gives you everything you need to run better and more often-including GPS tracking details of your run, customised coaching plans that fit your goals and adapt to your progress, and non-stop motivation from your friends. In short: We'll help you reach your goals and have more fun getting there. Any Apple Music subscriber can find Nike's playlists here, and set one to sync to Apple Watch for offline playback during runs without iPhone too. 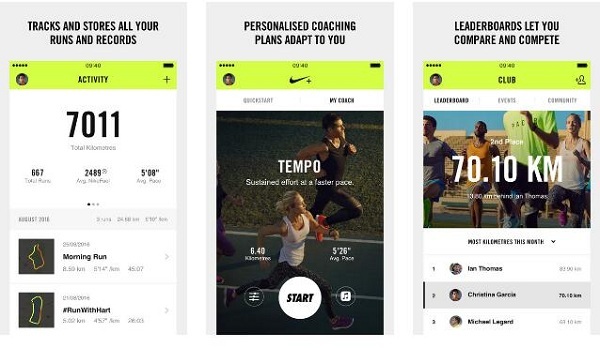 Nike also notes that all runs will now reliably sync with the Health app on your iPhone. Bold display of your running metrics at a glance. Hear audio readouts right from your watch. Smart invitations to run, personalized for you. Schedule run reminders to keep you motivated. Start, Pause, Resume and End your run with Siri. Nike+ Run Club takes advantage of the latest Apple Watch features, across all generations of hardware. Apple Watch Series 2 and Apple Watch Nike+ watches will fully track your route using GPS; whether you run with your phone or not. There still seems to be some differences between the Nike+ Run Club app from the App Store and the version included on Apple Watch Nike+, and I'm not sure about the Siri support mentioned above (I've tried it without success which could mean Apple Watch Nike+ only), but it's a significant update over the previous version. Nike recommends updating your Apple Watch to the recently released watchOS 3.1 update before using the new Nike+ Run Club app.